Climbing vines know how to climb but unfortunately they don't always climb the way you want them. So you have to encourage them to do as you would like. Whether they cover the wall of the house, hide an ugly feature, scramble through trees or fence, climbers are invaluable. There is no quicker way of achieving height in the garden and no , man-made” look of barriers and buildings. True climbers are plants that have some means of clinging on to a support - either tendrils, curling leaf stalks, adventitious roots or by twining. Many shrubs and some roses can, however, be trained to cover a wall or fence by regularly tying their shoots on to supports. The site and function of the climber will determine the type you can grow. Some climbers especially clematis and roses (Rosa sp. ), can be trained to grow through trees and other shrubs to give either a contrast in flower colour or to extend the season by flowering when the tree has finished. But avoid the vigorous types like Clematis montana and the Russian vine because they will swamp the tree. Other climbers, such as ivy (Hedera sp. ), make useful ground-cover plants for weed suppression. Many, like the ornamental vines and Virginia creeper (Parthenocissus quinquefolia), are grown for their dense, colourful foliage rather than their flowers. Climbing plants can be divided into groups according to the way they are trained. Some can support themselves, while others need to be provided with wires or a trellis. Some shrubs can be used as climbers if they are trained properly � these are known as wall shrubs. hydrangea (Hydrangea petiolaris). Simply plant them at the bottom of the wall and point them in the right direction. They will find their own way after that. They will not grow very quickly until they attach but, once they do so, they will soon make up for the delay. Twining climbers This group of climbers needs support. Some, like honeysuckle (Lonicera) or Wisteria, will twist themselves round any kind of support, while others, like clematis, are equipped with either tendrils or leaf stalks that are designed to twist round a support to hold up the stem. Both types will be happy climbing up wires, trellis or netting. 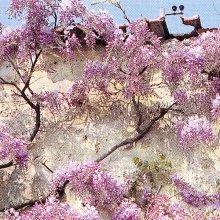 Wall shrubs: Some shrubs can be trained upwards, to give the same effect as climbing plants; climbing roses are often used to decorate pergolas and arches. They are not really climbers at all, but very vigorous shrubs, sending out long shoots. These shoots need to be tied in to the support as they appear. 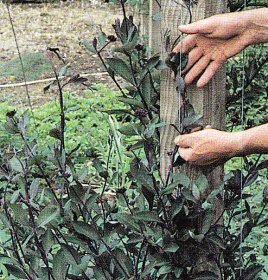 As with climbing roses on a wall, try to pull the shoots down almost horizontally as they grow to increase flowering. It takes a little longer to cover the support this way, but the restriction of the flow of sap will ensure that many more flowers will be produced. Other wall shrubs include cotoneaster and Firethorn (Pyracantha “Lalandeii”). Both of these plants can be trained to cover a wall or any type of fence. Watering: If the soil has been well prepare climbers will only need watering in very dry weather. Climbers on walls need extra watering if they are protected by overhanging eaves. Feeding: If the soil has been well prepared general border feeding should be sufficient. Cutting back: Self-clingers only need to be prevented from straying where they are unwelcome. They should be cut away from windows or the will block out the daylight quite quickly. Do this with shears or pruners whenever it is necessary. Spring is the best time. Pruning Climbers should be pruned annually to improve flowering. They can be divided into two pruning groups � the early-flowering plants, which should be pruned and dead-headed immediately after flowering, and those that flower later in the season, which should be cut back the following spring.